CD761x is the integrate EOC Master with one EOC master module and one ONU module. CD761x EOC Master can provide high speed data service based on coaxial cable network. CD761x built in a ONU. The module supports IEEE 802.3ah standards. It provide one SC/PC optical EPON uplink port and two 10/100/1000M auto-negotiable Ethernet RJ45 ports. Two TV+data mix output port. CD761x is the integrate EOC Master with one EOC master module and one ONU module. CD761x EOC Master can provide high speed data service based on coaxial cable network. CD761x built in a ONU. The module supports IEEE 802.3ah standards. It provide one SC/PC optical EPON uplink port and two 10/100/1000M auto-negotiable Ethernet RJ45 ports. By using the EPON technology, the ONU Module can provide a high-speed data channel through a single optical fiber with a rate of 1.25 Gbit/s on bi-direction. In addition, it offers the QOS, flexible bandwidth allocated to provide quality high-speed data service, voice service, and video service. The EOC Master Module is based the Qualcomm AR7410 chipset solution with high anti jamming capability OFDM technology. The 7.5-65MHz low frequency band is used for EOC signals. Built in high isolation filter as CATV RF and EOC signal mixer, the EOC signal and CATV signal in 87~862MHz can run on one cable without interference. The EOC Master can provide high speed data service. The PHY Layer speed is 600Mbps, the MAC Layer throughput is up to 320Mpbs. 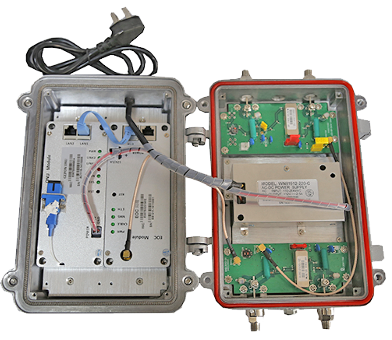 The ONU module connects with the EOC module, Ethernet data signals will be modulated into RF signals to transmit in the coaxial cable. CD761x integrating EOC and ONU can reduce the number of active node, decreasing failure rate and saving a space. It is the best choice of EPON+EOC solution for the operator.